In an article posted early this morning, Kotaku added some fuel to the ol’ rumor mill by announcing that, according to several of their sources, Final Fantasy Versus XIII, part of the series of games planned to take place in the Final Fantasy XIII universe, has been quietly cancelled. They say that instead of making a public announcement, Square Enix has decided to apparently let the game fade away, since stock concerns may arise if they make too much of a fuss. Final Fantasy XIII, released in 2009, was the latest in the venerable Final Fantasy franchise of JRPGs. Back when it was announced, however, it was also announced that there would be several games in the FF XIII “line”, as it were, spanning different genres and consoles. Said line is collectively referred to as the “Fabula Nova Crystallis” mythology, which incidentally sounds like the BEST GLAM ROCK BAND NAME EVER. One of the other installments in this line, Final Fantasy Type-0 (originally announced as “Final Fantasy Agito XIII“), which is for the PSP, appears to be in pretty fine health. But Versus had always had a…sporadic existence, popping up every now and then as if to remind you it was alive. Since its announcement in 2006, the game has made precious few appearances in public, and what little we know of the game’s overall play engine, one more action oriented than its predecessors, has come more from here-say than footage. The six-year blackout has given the game a sort of “vaporware” reputation, one that makes this announcement tragic but, to me, not earth shattering. It should be noted that, in the article, the writer mentions that Squeenix has actually folded the resources that would go to this game into the next numeric installment in the series, creatively titled Final Fantasy XV. If so, perhaps we need less look at this as the death of the game and more as an assimilation of it into a greater whole, like some JRPG Borg Collective. That makes it better, right!? Okay, all snarking aside, the difficult history of the game lends a sad amount of credence to this rumor (which, I must stress, is still a RUMOR). And to be perfectly honest, of all the generations of the game to do this in, Squeenix could not have chosen a worse installment to try something like this in. Although selling mightily, reviews and fan reaction in general for FF XIII have been rather divisive, with some reacting badly to the game’s innovations and cutbacks. FFXIII-2, released as a sort of answer to said complaints, further divided fans who regretted the focus gameplay change at the expense of storyline efficiency. By extension, any game that would be released under this line (the FNC games will all share the same universe, albeit at different periods in time) would have some amount of difficulty due to the association with the aforementioned installment. For comparison, when Final Fantasy X-2 was released back in the day, it was attached to an almost universally loved installment in the franchise, and, in addition to starting this retarded naming convention, even that game, due to tonal changes and the like, has an…interesting effect on the fandom. The FF XIII label, meanwhile, already inspires some heated division, and that may, honestly, have hurt this game a lot when it was released. Oh, it would have still sold more than a Beatles album released by Jesus himself, but the fanbase chaos would have been amazing. 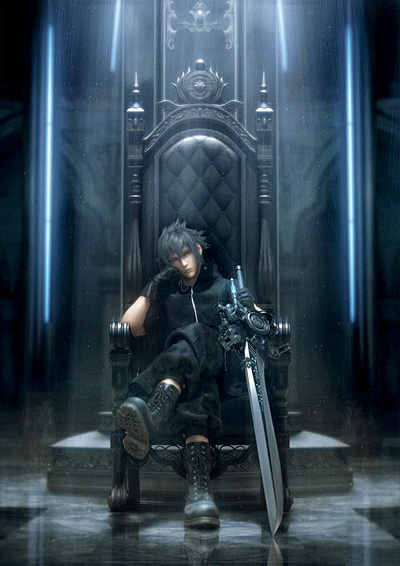 This entry was posted in Gaming News and tagged cancellation, final fantasy, final fantasy versus 13, noctis, square enix, tetsuya nomura, vaporware on July 20, 2012 by Hachi76.